The doors of a hotel are constantly revolving, welcoming new guests on a daily, and nightly, basis. One important thing guests will notice upon arrival is just how clean those doors are. Its no surprise that clean businesses do better and have a higher state of returning guests, but what is the secret formula for making this happen? For the staff of any hotel, it is important to view the property as your own. When taking ownership of the property, housekeepers especially, are more successful in their careers. When you treat each hotel guest as a visitor in your own home, it causes you to feel a sense of pride. This can be the difference between a job and a career. To start, personally getting to know the property will help you go far. Knowing what areas are used the most will help you know what needs the most attention, especially when it comes to housecleaning. Hotel rooms, for example, are cleaned every day, but there is always more that can be done to provide the best experience. Guests want to know that they are in the cleanest room possible if they can’t be in their own house. In each room, there are several frequently touched surfaces that need special attention. Doorknobs, light switches, nightstands, phones, remotes, and bathroom countertops should all be disinfected on a daily basis. For this, your product of choice should be an EPA registered product that will kill the germs of most concern. A2Z or L2Z is the ideal product that cleans and disinfects all in one step, without leaving any residue. Soft surfaces, such as curtains, bedspreads, and upholstered furniture typically are deep cleaned on a quarterly basis. To keep these surfaces clean, refresh and sanitize them every day. A product such as R24 will destroy odors and leave a pleasant fragrance in their place. II2 will deodorize by killing microorganisms that cause offensive odors and will sanitize soft surfaces in 5 minutes. In bathrooms, a big issue tends to be odor. The first step is to use an air freshener, like R22 or R23, that will eliminate foul smells in the air. There are other odors, however, that persistent on porous, damp surfaces, such as grout, which traps the bacteria sources that feed off urine. Wetting the surface, as well as humid conditions, can reactivate these odors. To take care of this, there are two products that will work wonders. Ready to Use hydrogen peroxide cleaner and Triple Action work for removing stains and breaking down odor-causing uric acid crystals. Ready to Use formulas do not need to be diluted, so they can do the job in less time. 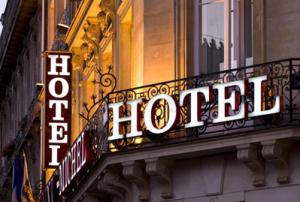 With odors and germs taken care of, your hotel will leave a good impression on visitors. Paying attention to detail is what can create a hotel that is truly a home away from home for guests.